What a fun day at We R today. We enjoyed soup, bread sticks, way too many treats (but we’re not complaining) and of course dressing up. We hope your day is equally as fun. 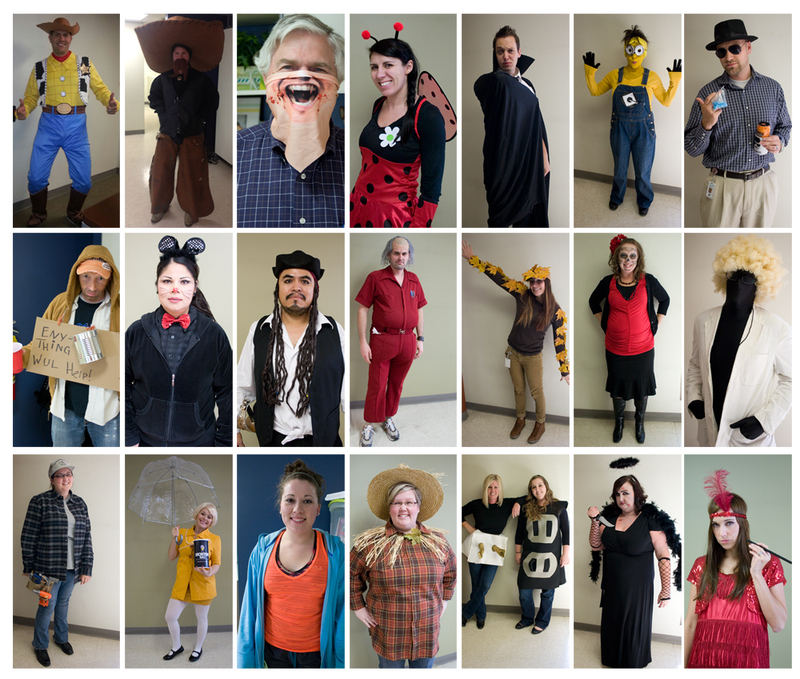 Here’s a Halloween layout if you need some inspiration for your favorite spooky photos from today. These photos are of my sweet four year old daughter who loves all things pink, princess, and fairy. She knew exactly what she wanted to be this year and has been anticipating this day for a while. She is so ready to go trick-or-treating! 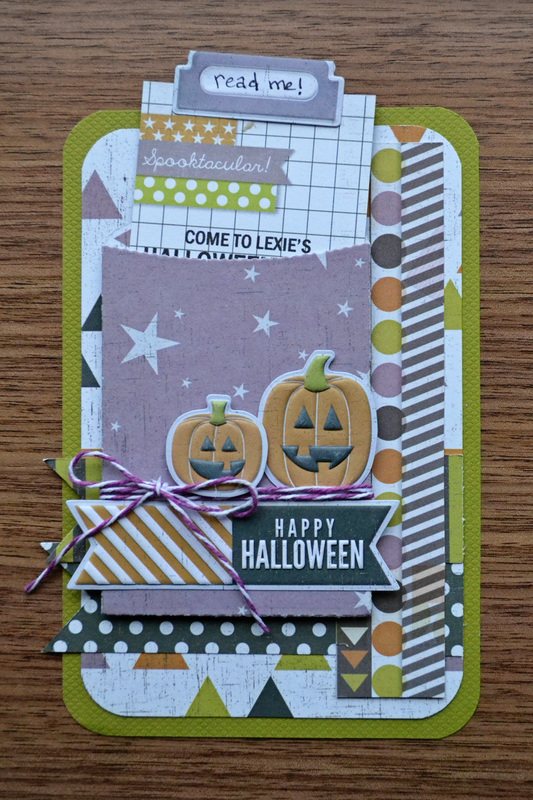 I used coordinating textured cardstock from the Bewitched collection to die cut some letters and shapes. I love that each collection always comes with matching cardstock–no need to search high and low for the perfect color! My title doubles as my journaling for this page, and it acts as a design element as well. 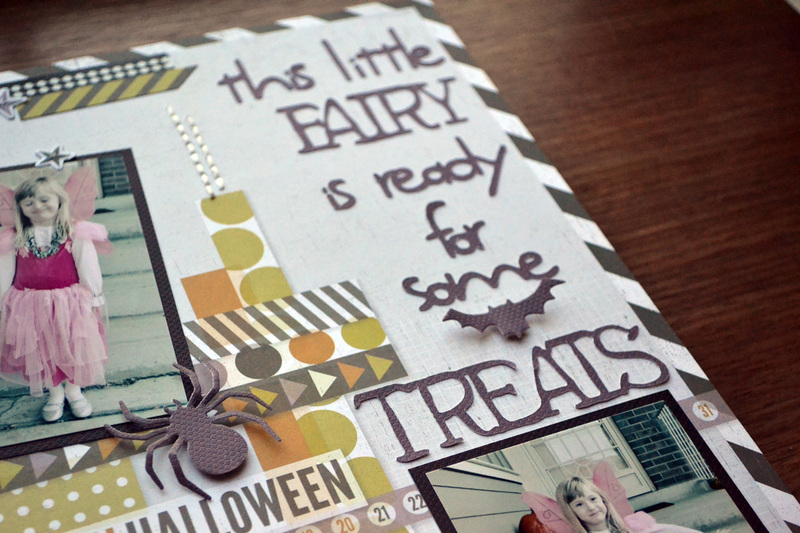 I used the Lifestyle Crafts Spider Shape Die and the Bat and Moon Punch Die to cut some accents for my page. The Bat and Moon Punch Die includes a single set of the dies as well so you don’t have to cut multiple shapes if you don’t need them. I adhered them with foam squares and gently bent the edges for added dimension. I also added some subtle white stitching to the white backgrounds using my Sew Easy tool and floss. Adding tone-on-tone layers creates interest and depth without detracting from the most important elements on your project. I hope these ideas have inspired your Halloween memory keeping. Try one of these tips out on your next festive project and link us up in the comments section below. Have a fun and safe Halloween! Hi ,my name is Marielle from New Brunswick, Canada and I am delighted to have been invited here today as your guest designer. I had the pleasure of working with samples of the Bewitched collection. If you’re planning on sharing some treats this Halloween, why not try creating a custom doily to add that special spooky touch. Line a plate or tray with your favorite Halloween colored paper after punching it with the Lucky 8, or Mini 8 punch and your goodies will look extra irresistible. To create this custom doily I used a sheet of white cardstock, a sheet of black cardstock, an orange 12×12 washi adhesive sheet, and the Retro Scallop Lucky 8 Punch. First, I pulled the adhesive backing off the washi sheet and carefully added it to the white cardstock. Designer tip: use a plastic card to smooth the washi sheet and squeeze out any air bubbles after adhering it to the cardstock. 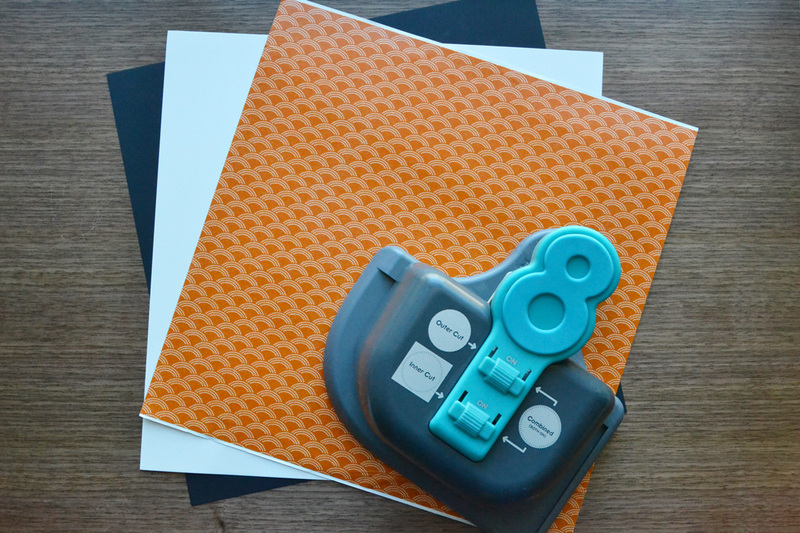 Next, I punched the washi covered cardstock with the Retro Scallop Lucky 8 Punch using both the outer and inner cuts. To add some contrast I punched a sheet of black cardstock with the same Lucky 8 Punch using only the outer cut. I layered the two punched sheets of cardstock on a white platter, and voila! 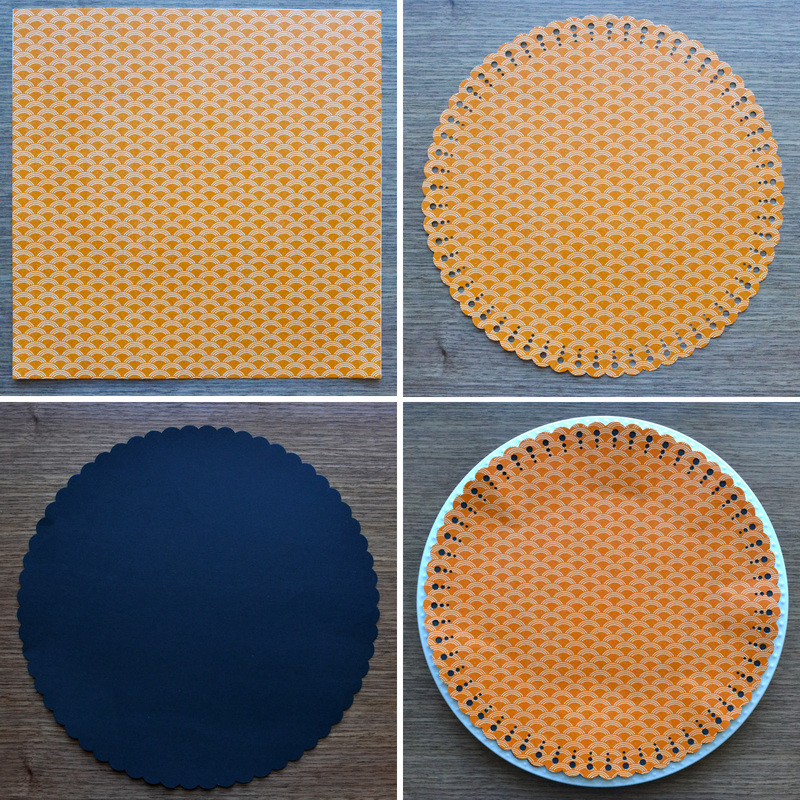 The washi adhesive sheet makes a perfect grease-proof custom doily, but you can also use your favorite colored cardstock, or patterned paper. You can also use the Mini 8 punch for smaller batches of treats. Custom doilies work great for delivering treats to neighbors and friends, parties, school treats, and you can make them for any holiday or occasion using the right papers and colors. P.S. 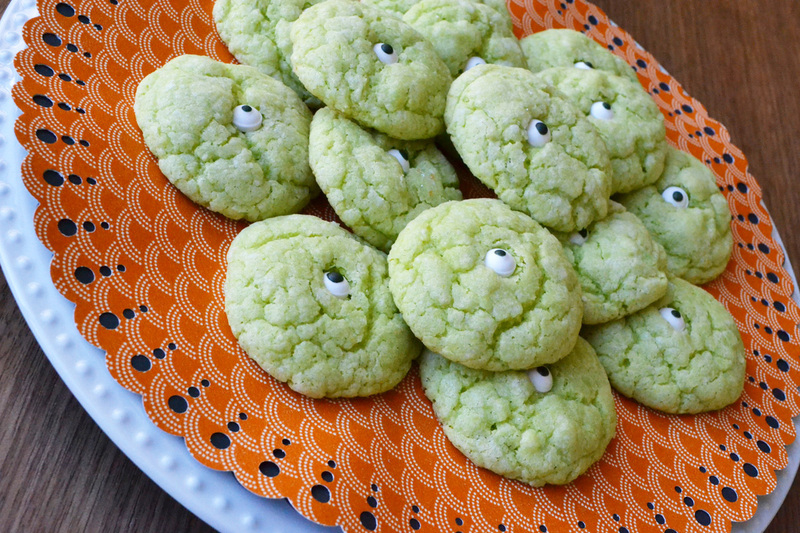 CLICK HERE for the recipe for these yummy and festive Gooey Monster Eye Cookies! 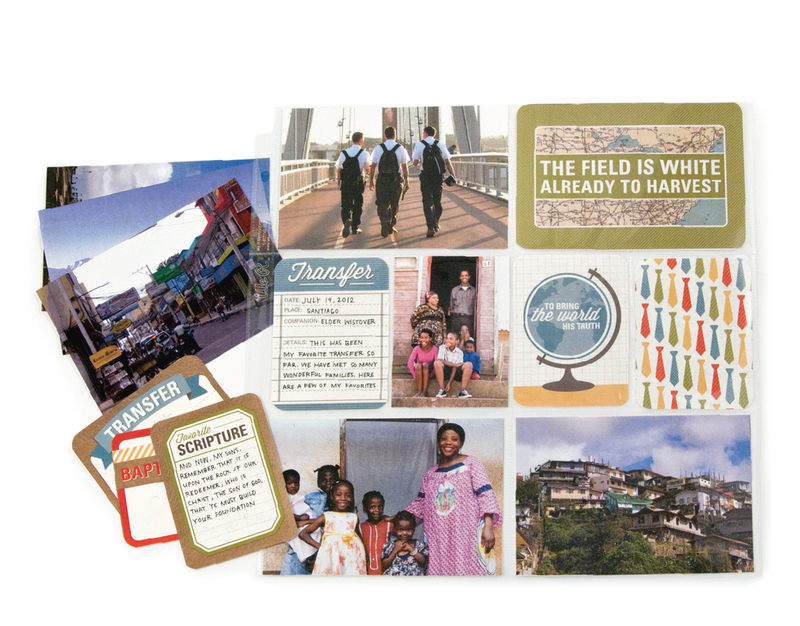 The Missionary Albums Made Easy System helps document missionary service in three easy steps. 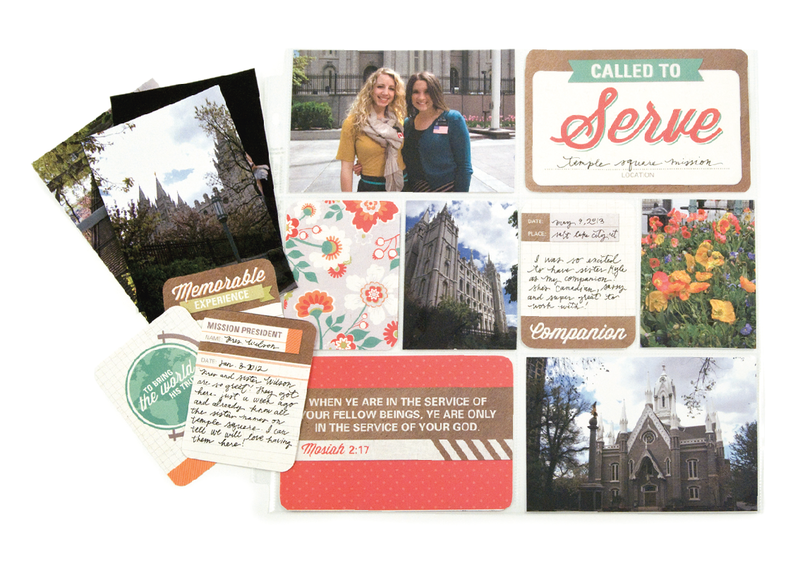 Take a look at this tutorial video to see the Missionary Albums Made Easy kit in action. Create your own Candy Boxes for your next party. Fill the Candy Box with your favorite treats and goodies. It’s a perfect Halloween candy container or perfect as a filled gift for the upcoming holiday season. 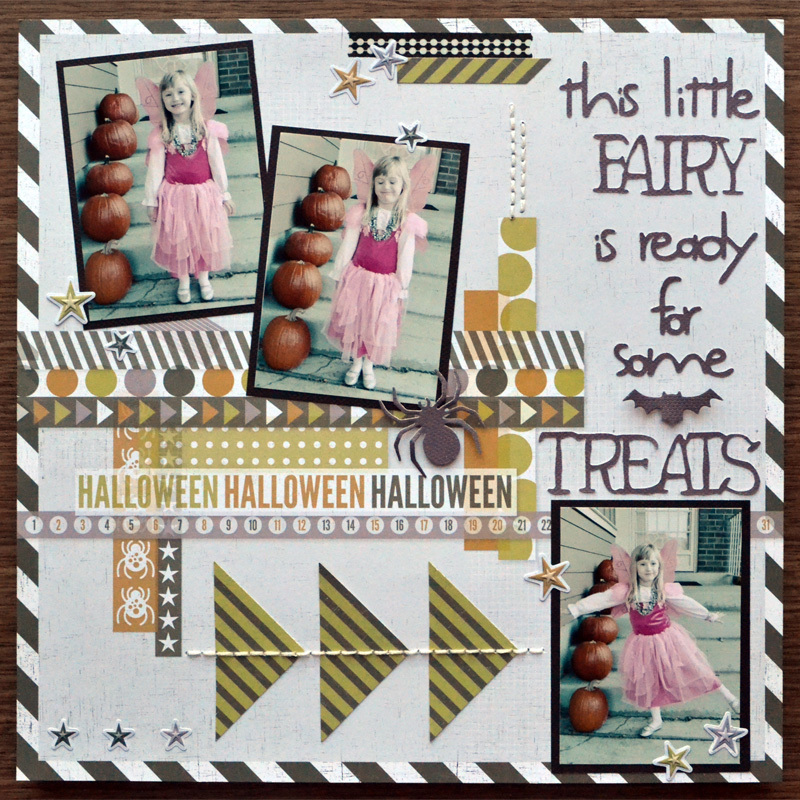 Learn how easy it is to use the Candy Box Punch Board with this tutorial video. Don’t forget about the other Punch Boards to help you create a variety of boxes and bags. This year I volunteered to come up with a craft for my daughter’s class Halloween party. She and I thought it would be fun to create Make-Your-Own-Monster Kits. So, we cut a box for each classmate from Bewitched patterned paper using the Lifestyle Crafts Evolution machine and the Bakery Box Template Die. My daughter is thrilled and can’t wait to share these at her class party! 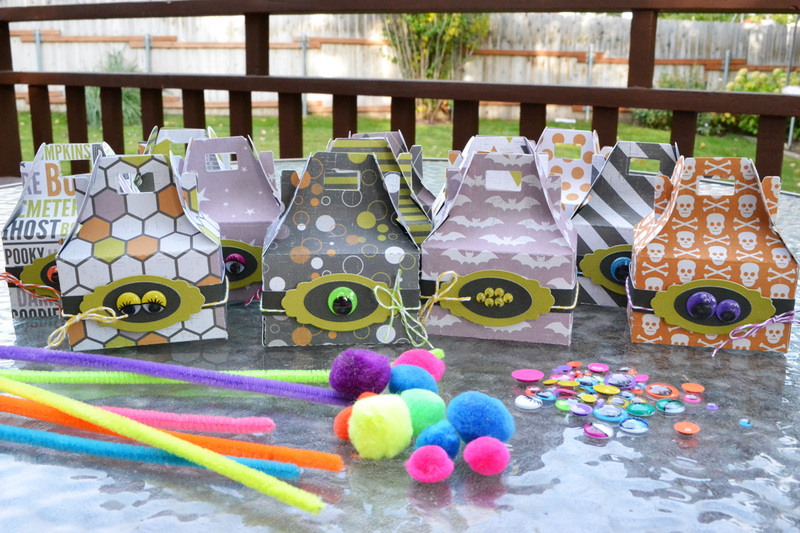 These boxes are the perfect size for the monster kits, but they would also be great for a few pieces of candy, some stickers, fun erasers, or other small trinkets for a party or for trick-or-treaters. 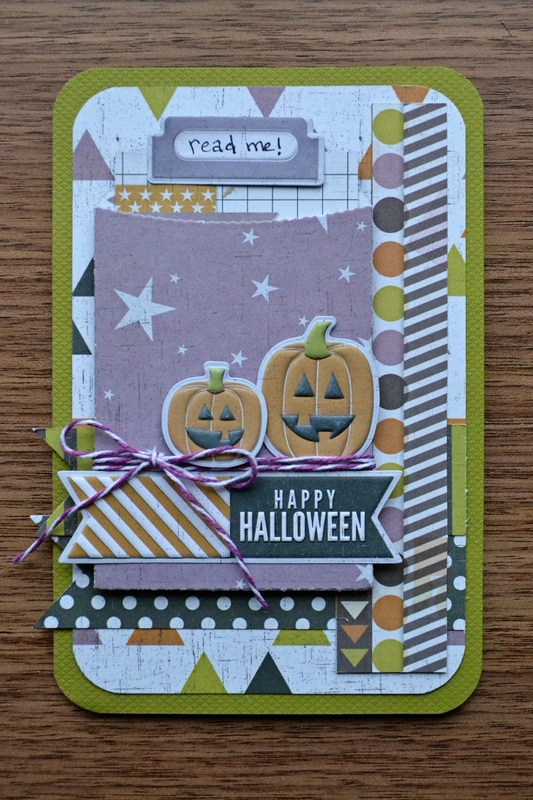 I love that the fun box shape looks so cool, but is quick and easy to make with the template die. Happy Halloween crafting! I’m so excited to be guesting for WRMK today. My name is Misty Buck. I’m from a rural mountain town in New Mexico. I’ve been scrapbooking since 1995 and have loved watching the industry grow. The best part -getting to design with beautiful products such as the ones We Are Memory Keepers makes is just a dream come true. You can visit me anytime at Li’l Buck’s Creations! 1. I started the by covering a straw wreath with black burlap ribbon. 2. I then cut multiple rolled flowers out with my Silhouette from the Bewitched papers. 3. I attached them with pins first and then hot glued them in place. The project was finished in a few hours and it’s awesome that the papers coordinate so well and are such fun patterns to work with. If you’re planning a spooky get-together this time of year and need an idea for a fun invitation, consider including an interactive element. As fun as it is to receive an invite to a party, it’s even more fun when it requires a little interaction on your part, don’t you think? 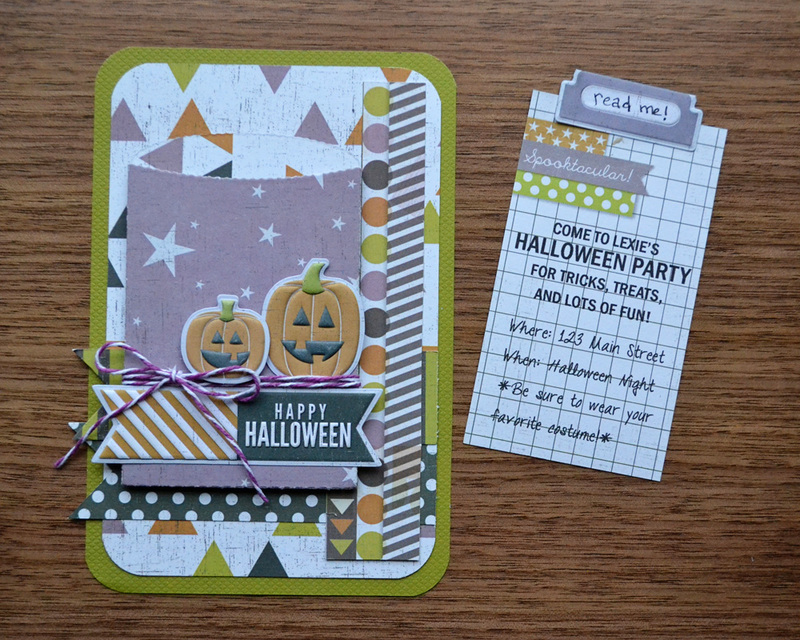 I created this interactive pocket invitation for my daughter’s Halloween party using the Lifestyle Crafts Mini Pocket Template Die. To create your own pocket invitation, cut a 4×6 inch background from textured cardstock and round the corners with the 1/2 inch Corner Chomper. Trim a 3 5/8 x 5 5/8 inch piece of Bewitched patterned paper, round the corners, and layer it on top of the cardstock background. Add some vertical and horizontal banners and strips of patterned paper, then cut a pocket using the Mini Pocket Die and Evolution. Fold and glue the tabs to the back of the pocket, and add it to the card. Designer tip: adhering the pocket with foam squares adds nice dimension to the card and makes the interactive pocket stand out. Trim a journaling card to fit the pocket, print or hand write your party details on the journaling card and add it to the pocket. Finish off the card by embellishing it with some baker’s twine and embossed stickers. Other ideas for using the Mini Pocket die are hidden journaling on a scrapbook page, storage for memorabilia on a scrapbook page, and a gift card holder–the die is the perfect size for a gift card! Today’s eye candy is sponsored to you by the Bewitched collection from We R Memory Keepers. 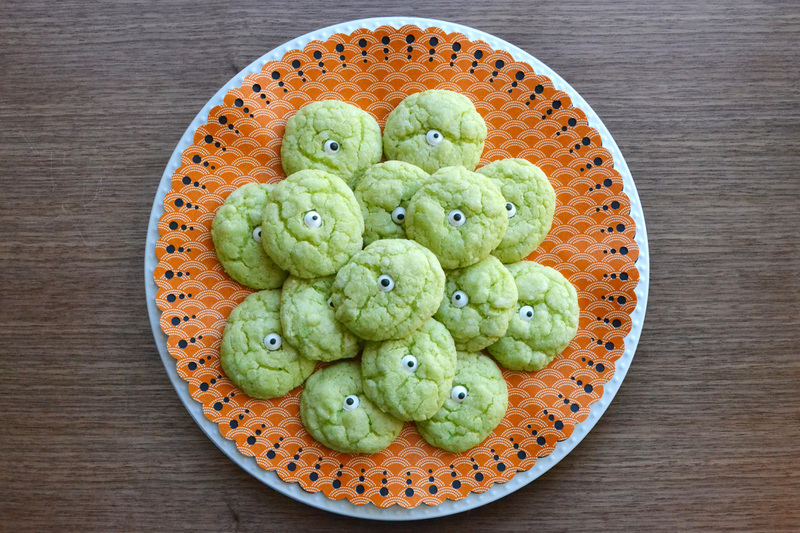 Take a playful and fun approach to the spooky Halloween season by carving pumpkins, frosting cookies, and planning special tricks and treats for your loved ones. The Bewitched collection helps to do just that by combining iconic spider webs and bats, with geometric stripes, zig-zags, hexagons, and triangle shapes, and brews it altogether with a little hocus pocus. Look for a traditional – yet muted – Halloween color palate such as October orange, poisonous purple, goblin green, and bogeyman black.